Location: Corner of 104 St. & 104 Ave. 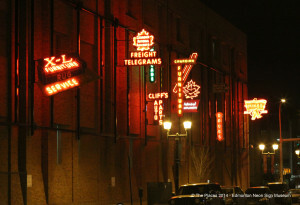 The Neon Sign Museum – the first of its kind in Canada – features an outdoor collection of historic signs that tell a story about Edmonton’s neon past. The City of Edmonton has collected 12 neon signs, eight of which have been restored and installed on the side of the Telus building on 104 Street and 104 Avenue. The signs that were chosen are iconic signs and representative of the commercial signage that was so prevalent in Edmonton’s history. The City is looking for more signs for the museum from Edmonton and region. If you have or know of any, please contact Edmonton Sustainable Development.